^ a b c d e Smith, Martin R.; Ortega-Hernández, Javier (2014). 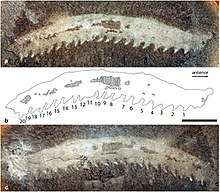 “Hallucigenia's onychophoran-like claws and the case for Tactopoda”. Nature 514 (7522): 363–366. Bibcode: 2014Natur.514..363S. doi:10.1038/nature13576. PMID 25132546. http://dro.dur.ac.uk/19108/1/19108.pdf. ^ Martin, Christine; Mayer, Georg (2014-02-26). “Neuronal tracing of oral nerves in a velvet worm—Implications for the evolution of the ecdysozoan brain”. Frontiers in neuroanatomy 8: 7. doi:10.3389/fnana.2014.00007. https://www.researchgate.net/publication/260684437_Neuronal_tracing_of_oral_nerves_in_a_velvet_worm-Implications_for_the_evolution_of_the_ecdysozoan_brain. ^ Mayer, Georg; Whitington, Paul M; Sunnucks, Paul; Pflueger, Hans-Joachim (2010). “A revision of brain composition in Onychophora (velvet worms) suggests that the tritocerebrum evolved in arthropods” (英語). BMC Evolutionary Biology 10 (1): 255. doi:10.1186/1471-2148-10-255. ISSN 1471-2148. PMC: PMC2933641. PMID 20727203. https://bmcevolbiol.biomedcentral.com/articles/10.1186/1471-2148-10-255. ^ Martin, Christine; Mayer, Georg (2015-08-25). “Insights into the segmental identity of post-oral commissures and pharyngeal nerves in Onychophora based on retrograde fills” (英語). BMC Neuroscience 16 (1). doi:10.1186/s12868-015-0191-1. ISSN 1471-2202. PMC: PMC4549126. PMID 26303946. https://bmcneurosci.biomedcentral.com/articles/10.1186/s12868-015-0191-1. ^ “Segmentation in Tardigrada and diversification of segmental patterns in Panarthropoda” (英語). Arthropod Structure & Development 46 (3): 328–340. (2017-05-01). doi:10.1016/j.asd.2016.10.005. ISSN 1467-8039. https://www.sciencedirect.com/science/article/pii/S1467803916301487. ^ Rota-Stabelli, Omar; Kayal, Ehsan; Gleeson, Dianne; Daub, Jennifer; Boore, Jeffrey L.; Telford, Maximilian J.; Pisani, Davide; Blaxter, Mark et al. (2010-01-01). “Ecdysozoan Mitogenomics: Evidence for a Common Origin of the Legged Invertebrates, the Panarthropoda” (英語). Genome Biology and Evolution 2: 425–440. doi:10.1093/gbe/evq030. https://academic.oup.com/gbe/article/doi/10.1093/gbe/evq030/573488. ^ Franke, Franziska Anni; Mayer, Georg (2014-12-03). “Controversies Surrounding Segments and Parasegments in Onychophora: Insights from the Expression Patterns of Four “Segment Polarity Genes” in the Peripatopsid Euperipatoides rowelli” (英語). PLoS ONE 9 (12): e114383. doi:10.1371/journal.pone.0114383. ISSN 1932-6203. PMC: PMC4255022. PMID 25470738. https://journals.plos.org/plosone/article?id=10.1371/journal.pone.0114383. ^ Telford, Maximilian J.; Bourlat, Sarah J.; Economou, Andrew; Papillon, Daniel; Rota-Stabelli, Omar (2008-04-27). “The evolution of the Ecdysozoa” (英語). Philosophical Transactions of the Royal Society B: Biological Sciences 363 (1496): 1529–1537. doi:10.1098/rstb.2007.2243. ISSN 0962-8436. PMID 18192181. http://rstb.royalsocietypublishing.org/content/363/1496/1529. ^ a b Javier, Ortega-Hernández,. “Making sense of ‘lower’ and ‘upper’ stem-group Euarthropoda, with comments on the strict use of the name Arthropoda von Siebold, 1848” (英語). Biological Reviews 91 (1). ISSN 1464-7931. https://www.academia.edu/9363838/Making_sense_of_lower_and_upper_stem-group_Euarthropoda_with_comments_on_the_strict_use_of_the_name_Arthropoda_von_Siebold_1848. ^ Edgecombe, Gregory D. (2009-03-03). “Palaeontological and Molecular Evidence Linking Arthropods, Onychophorans, and other Ecdysozoa” (英語). Evolution: Education and Outreach 2 (2): 178–190. doi:10.1007/s12052-009-0118-3. ISSN 1936-6426. https://link.springer.com/article/10.1007/s12052-009-0118-3. ^ a b Murdock, D. J. E.; Gabbott, S. E.; Purnell, M. A. (2016). “The impact of taphonomic data on phylogenetic resolution: Helenodora inopinata (Carboniferous, Mazon Creek Lagerstätte) and the onychophoran stem lineage”. BMC Evolutionary Biology 16 (19): 19. doi:10.1186/s12862-016-0582-7. PMC: 4722706. PMID 26801389. https://www.ncbi.nlm.nih.gov/pmc/articles/PMC4722706/. ^ Ou, Qiang; Shu, Degan; Mayer, Georg (2012-01). “Cambrian lobopodians and extant onychophorans provide new insights into early cephalization in Panarthropoda” (英語). Nature Communications 3 (1). doi:10.1038/ncomms2272. ISSN 2041-1723. https://www.nature.com/articles/ncomms2272. ^ a b Caron, Jean-Bernard; Aria, Cédric (2017-01-31). “Cambrian suspension-feeding lobopodians and the early radiation of panarthropods” (英語). BMC Evolutionary Biology 17 (1). doi:10.1186/s12862-016-0858-y. ISSN 1471-2148. PMC: PMC5282736. PMID 28137244. https://doi.org/10.1186/s12862-016-0858-y. ^ a b c Siveter, Derek J.; Briggs, Derek E. G.; Siveter, David J.; Sutton, Mark D.; Legg, David (2018-08-01). “A three-dimensionally preserved lobopodian from the Herefordshire (Silurian) Lagerstätte, UK” (英語). Royal Society Open Science 5 (8): 172101. doi:10.1098/rsos.172101. ISSN 2054-5703. http://rsos.royalsocietypublishing.org/content/5/8/172101.